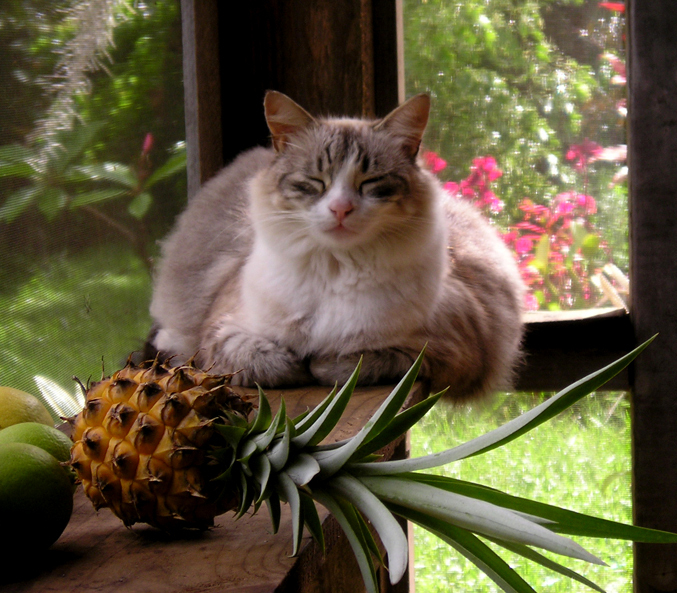 Continuing in the category of who’s eating what where, here’s another shot of what they’re eating on Maui, with another cat as bonus. This is Phatboi, who I suspect got fat off of something other than pineapples and limes. Send me your who’s-eating-what-and-where photos! But please, mind the quality of your photography. Whatever your subject is, get up as close to it as possible and frame it nicely. Attend to your foreground and background. There’s a world of difference between a photograph and a snapshot. One is art. The other is, well, practice until you learn to make art with your camera. This was written by daltoni. Posted on Friday, December 5, 2008, at 4:06 pm. Filed under Food. Bookmark the permalink. Follow comments here with the RSS feed. Post a comment or leave a trackback.